Description: The 260,000 sf museum houses an extensive collection of more than 1 million Native American objects. Program areas include indoor and outdoor public spaces, a private performance theater, a retail department, food service, and areas for art and artifact restoration, research, and administration. 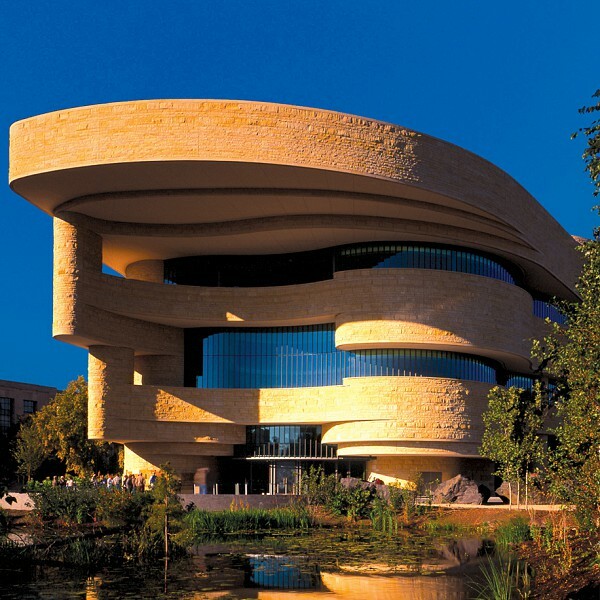 The building also features a central meeting place called the Potomac, a dome-topped public area where museum visitors can experience dance, drama, music, oral history and story-telling, and demonstrations by artists in residence on Native American traditional life-skills. Air temperature and control of air circulation were critical issues for this project, particularly given the project’s unique façade and geometry. Air systems for public areas incorporate water economizers that minimize the use of louvers on the building’s exterior, and minimize temperature fluctuation during variations in the temperature of outside air. Concealed curvilinear outlets were placed in the majority of the museum’s spaces to allow for quiet ventilation without compromising the interior architecture. Air handling units equipped with special housing and additional carbon and chemical filtration features (with a minimum of 95% efficient filters) insure proper air quality. Slow air distribution from ceiling to floor return vents minimizes the distribution of airborne particles in areas like the galleries and theater. The Potomac's large volume is used as a collection point for spill air from throughout the building. Excess air from the museum’s galleries and other functioning areas is circulated at various levels into the Potomac, where it is expelled from the dome. Computational Fluid Dynamics analysis for smoke purge testing ensured proper placement of smoke exhaust intakes in the Potomac. The museum required that all electro/mechanical infrastructure be incorporated into a single distribution system to reduce space requirements, and to allow for efficient access to all systems for maintenance and adjustments. Outlets for telecommunications systems can also be used to access the security system via handheld devices, and the public address system can also be used for emergency messaging.